What is Clearine Eye Drops (Zaphazoline) used for? 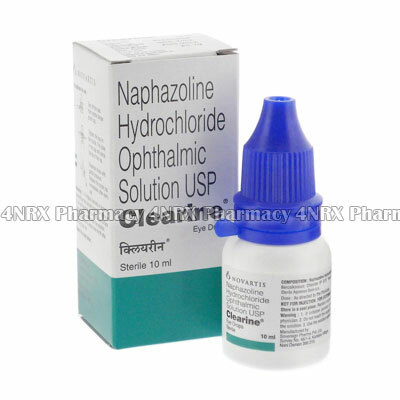 Clearine Eye Drops (Naphazoline) are an ophthalmic medication used to treat red, irritated, or bloodshot eyes. It operates by constricting swollen blood vessels in the eyes to reduce the appearance of redness making it useful for reducing minor swelling or discomfort caused by irritants. Your doctor may also prescribe it for the treatment of other unlisted conditions. How should I use Clearine Eye Drops (Zaphazoline)? Clearine Eye Drops (Naphazoline) is normally administered at the first sign of eye irritation or redness. The best dosage will be determined by your doctor after observing the severity of your symptoms. Wash your hands before each usage and remove your contact lenses if you wear them. Pull down the lower lid of the eye being treated, hold the bottle over the eye, and dispense one drop into the pouch that is formed. Slowly close the eye and keep it closed for thirty seconds to spread the medication and allow it to be absorbed. Observe the solution prior to each application to make sure it is not cloudy or discoloured as this may indicate contamination. Ask your pharmacist or doctor if you have any questions about the medication to ensure the correct usage. What are the side effects of Clearine Eye Drops (Zaphazoline)? More serious side effects that may possibly require medical attention are severe eye pain, loss of vision, chest pain, irregular heart rate, severe headaches, trouble breathing, tinnitus, or deterioration of your symptoms. Inform you doctor as soon as any symptoms occur that are intense or worrying to make sure the appropriate adjustments are made to your dosage. Clearine Eye Drops (Naphazoline) should not be used to treat patients with eye infections, glaucoma, who are under the age of twelve, or who have had recent eye surgery. Always remove your contact lenses before using this medication. Strictly use Clearine Eye Drops (Naphazoline) as prescribed and follow all instructions provided by your doctor. Safe, suitable, and optimum dosage can vary and is dependent on the patient`s health and medical history, as well as the condition you are treating. Clearine Eye Drops (Naphazoline) may not be safe or suitable for all patients. Always ensure your doctor is informed if you are pregnant or breastfeeding, using any other type of medication (including non-prescription medicine, vitamins, and supplements), as well as if you have any allergies, other illnesses, or pre-existing medication conditions.